When you hear the words Vancouver Island you probably think of February flower counts, storm watching in Tofino and salmon fishing in Campbell River. But, did you know that Vancouver Island is also home to some pretty amazing ski hills? 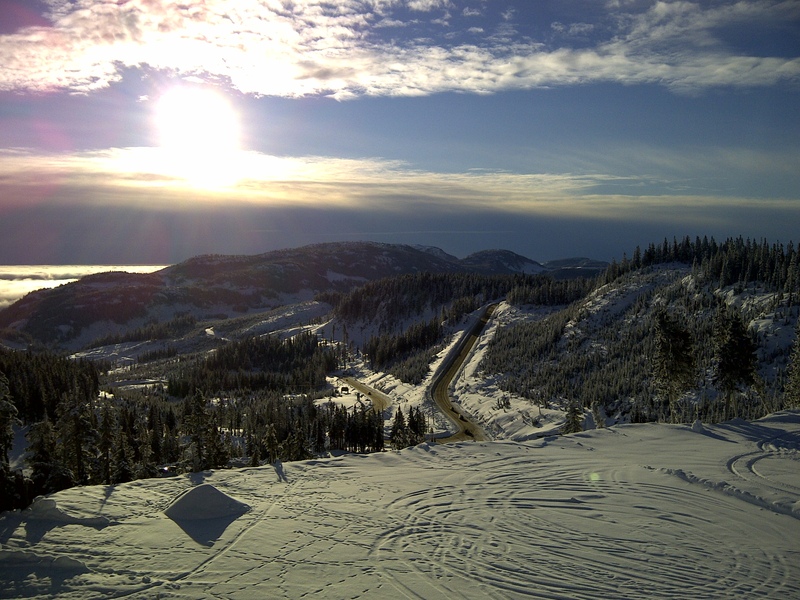 That’s right; as if this little jewel of an island wasn’t precious enough, Vancouver Island ski hills (like Mt. Washington Alpine Ski Resort), routinely boast some of the highest annual snow base in North America. That’s great news if you like to celebrate the snow gods by hurtling yourself down a mountain, but it can also mean a challenging drive for folks heading up and down said mountain. If you are heading up to Mt. Washington, there are some things you should know before you go. The Strathcona Parkway runs from the Inland Island Highway (BC Highway 19) to Mt. Washington Alpine Ski Resort and provides access to Paradise Meadows in Strathcona Provincial Park. The Parkways is roughly 18 kilometres long and has an elevation difference of approximately 1000 metres from top to bottom. This means that the temperatures can be several degrees different at any given time on the bottom than they are at the top. Freezing temperatures halfway up the mountain can mean that the rain you start out in could turn into a blizzard closer to the top. 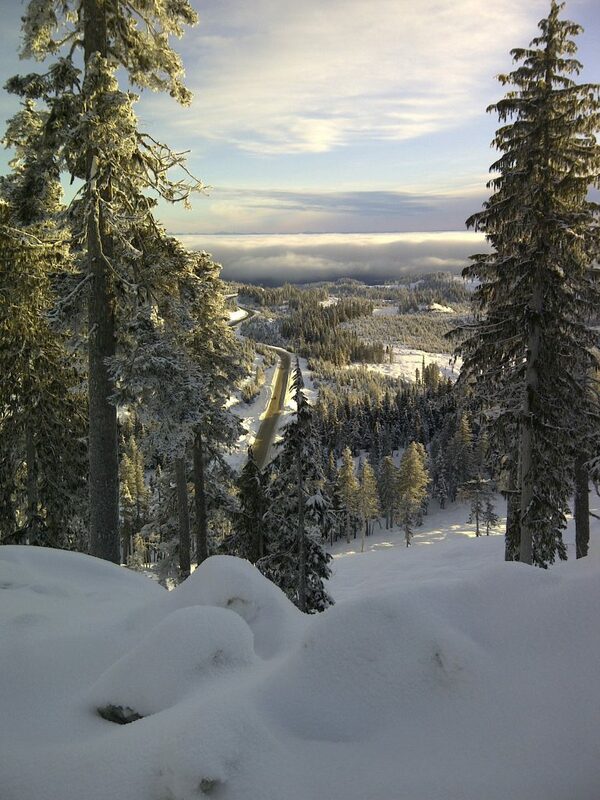 Weather can also be sunny and beautiful up on top of the mountain with blizzard conditions in effect coming down. We work closely with Mainroad North Island Contracting, our local maintenance contractor, to keep things running smoothly. They do a great job of routinely salting, sanding and clearing snow from Strathcona Parkway. But when snow storms hit at lower elevations they have to work extra hard to keep on top of the Inland Island Highway and the Strathcona Parkway. Crews will work around the clock until the roads are clear, but drivers need to be prepared to chain-up or change their plans on a moment’s notice. Elevation, temperature and condition differences around Mt. Washington. 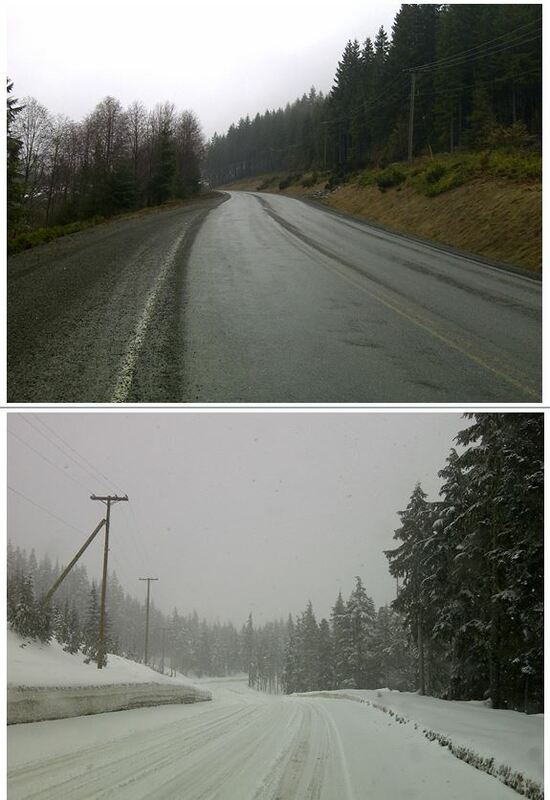 These two images were taken on the same day travelling up Mount Washington. Don’t be deceived by fair weather. Drivers MUST use good winter tires, carry chains and know how to use them when travelling on the Parkway in the winter. Snow on Vancouver Island is usually wet and can become very slippery when packed down, so good traction is essential. All-season tires and four-wheel drive cannot be counted on when the conditions are bad. When chain-up signs and lights are activated the use of chains is mandatory for all vehicles (regardless of whether a vehicle is capable of using chains or not). Waiting too long to put on chains or trying to put chains on between designated areas can be very dangerous. There are chain-up areas at the bottom of the hill (at approx. 0.5 km), at Anderson Hill (6 km) and at Ramparts Creek (10 km). If you are heading down the mountain, you should chain-up in a parking lot beforehand. Mt. Washington also runs a shuttle bus service which means that if a vehicle is not capable of driving up the mountain, users can park at the base and use the shuttle service. So, there you have it – the Mount Washington/Strathcona Parkway rundown. The next time you pack your car and head for the hill be prepared for a little bit of everything. That way you can be sure that the only tales of epic snow you share with your friends are slope side not road side. Do you have a question about this, or anything else the Ministry of Transportation and Infrastructure does? Let us know in the comments below. I have traveled extensively throughout Washington State and British Columbia and It’s really frustrating to have very poor pavement markings on the roadways of BC compared to the road markings in Washington State. Washington State markings at night are highly reflective and it makes driving so much safer. Are the contractors in BC trying to save money by not using highly reflective paint? Hi John and thanks for your comment. We understand your frustration. Our line painting contractors repaint over 30,000 kilometres of centre and lane lines every year across the province, at a cost of over $11 million annually. Each year $2 m worth of durable long line is placed throughout the province – primarily in the South Coast Region. Our neighbours to the south are funded federally for their transportation and infrastructure improvements, whereas our budget is determined provincially. We are happy to say that the recent announcement of the 2018 budget includes operating expenditure increases of $46.5 million for our ministry. Of those additional funds, $12 million has been allocated for road and bridge maintenance and electrical maintenance, as well as specific provisions for enhancing pavement marking. As part of our efforts to find the best paint solution, we also share research information and testing results with our neighboring highways organizations in Alberta, Alaska, Washington and Idaho. These jurisdictions most closely match our geography and climate which are far harsher than most – if not all – other North American jurisdictions. We hope that this helps answer your concerns. Why are snow tires and chains required on the Mt Washington ski hill road and not other more treacherous ski hill mountain roads in BC? Winter tires are required across the majority of the province, including ski hill roads and we think carrying chains is always a good idea. Mt. Washington poses a special problem with its wet and slippery snow and drivers who aren’t as familiar with winter driving conditions.Hope that this helps. 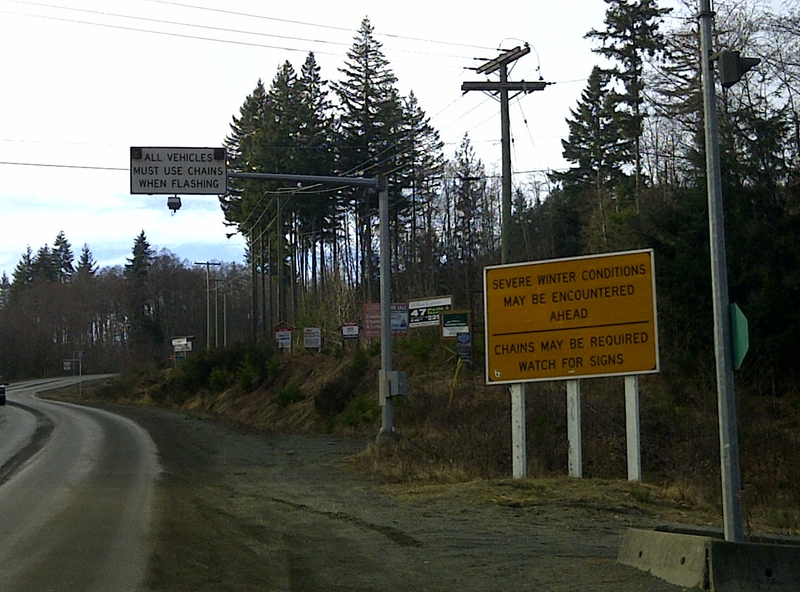 Further to this – can you please clarify if this “recommendation” is mandatory – the mountain staff regularly turn back cars without chains – however, our manufacturer (Subaru Legacy) specifically states our model is not capable of using chains – we have studded winter tires – are they still legally able to deny access to this public road? When the chain up lights are on chains are mandatory for ALL vehicles, regardless of whether the vehicle is capable of using chains or not. Mt. Washington runs a shuttle bus so if a vehicle is not capable of driving up the mountain, users can park at the base and use the shuttle service. Typically the chains up lights usually come on less than 5 times per season (this depends on the season). However, when these lights do come on Emcon works incredibly hard to get the road back to an acceptable standard and turn the lights off as soon as they safely can. Usually when there is a delay in turning the lights back off again it is due to drivers continuing past the lights without chains and spinning out or ending up in the ditch which blocks the plow trucks and adds time to the cleanup efforts. Hope that this helps. Just noticed there was a reply to this – just cant let this one go – as far as i can determine, there is no legal avenue to bar someone from using this public road if they have tires with the M&S symbol — this is a hold-over from the days when it was a PRIVATE unpaved road. We have full studded tires on an all wheel drive car – more than adequate – can you provide links to the relevant regulations that allow contractors or mtn staff to bar public access to a provincial road? Yes, we are sorry but our system doesn’t seem to send a notification when we respond. Further to your question above, Strathcona Parkway is a public road under the jurisdiction of the Ministry of Transportation and Infrastructure. It is a class 4A and the maintenance contractor maintains it as such. Section 208 of the BC MVA, specifically section 2 and 3 quoted below, outline the language which referenced in prohibiting access to the road during inclement weather causing dangerous driving conditions. 208 (1) For the purpose of this section, “winter tire” means a tire that meets the standards and specifications prescribed for winter tires. (2) The minister responsible for the administration of the Transportation Act may, by public notice or by placing signs, prohibit any vehicle or a class of vehicles from being driven or operated on a highway, unless the vehicle is equipped with chains, winter tires or traction devices, or a combination of these, that the minister responsible for the administration of the Transportation Act considers adequate in view of prevailing road conditions. (3) A public notice or sign under subsection (2) may provide differently in relation to specified dates, prevailing weather conditions or any other criteria the minister responsible for the administration of the Transportation Act considers necessary or advisable. (4) A person who drives or operates a vehicle in contravention of a prohibition made under subsection (2) commits an offence. Your reply contradicts what is stated elsewhere on this page “drivers must carry chains.” What is the correct answer “must carry chains” or “we recommend…. carrying chains”? Commercial vehicles must carry chains but we recommend passenger vehicles carry chains. Hope that this helps!